Condemn Police atrocities in Sonbhadra! 18th April 2015: In less than 4 days of open firing at peaceful protesters in Sonbhadra on 14th April Ambedkar Jayanti, today again police wreaked havoc by shockingly open firing in the morning at the protesters including large number of women in Kanhar valley, Amwar, Duddhi Sonbhadra, UP. Reports of rampage in villages Sundari and Bhisur have also come where houses are smashed and hundreds of people are beaten. While the exact numbers of deaths and people suffering injuries are not yet confirmed, it is reported that numbers would be quite high. This is clearly a planned brutal attack to crush people’s peaceful and democratic resistance against the illegal construction of Kanhar dam which will cause massive displacement due to forcible land acquisition. 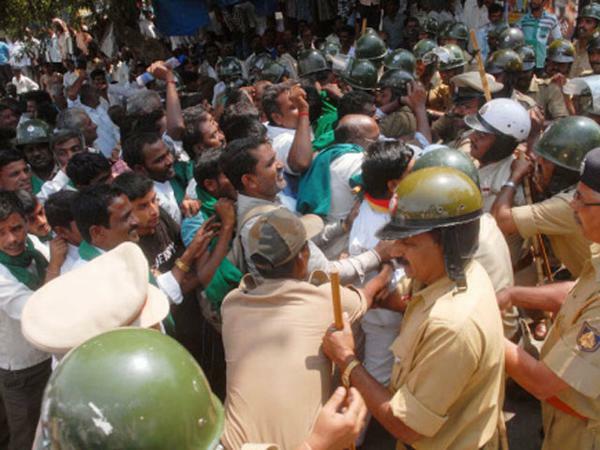 Use of violence by the police and administration on agitating people is not new in Kanhar Vally. On 23rd Dec 2014 they were brutally beaten and false allegations of attack on SDM were made to victimise the leaders. There have been continuous attempts to harass people by the nexus between police-local land mafias to deny land and forest rights of hundreds of poor villagers. On 14th, police fired at the gathering which left at least 6 women seriously injured and Adivasi leader Akku Charu who was shot in the chest is admitted in BHU lucknow. Despite constantly increasing number of force in the valley, including the PAC (provincial armed constabulary) and attempts to block people from joining the protesters, immense support has poured in from Madhya Pradesh, Chhattisgarh, Delhi, Gujrat, Uttar Pradesh as well as from Political Representatives, Political Parties, Activists, Scholars, etc for the struggle. Further, while efforts are underway to send a fact fining team so that actual happenings in the area can come out, today’s attack is seen as an attempt to stop this process of investigation, which would highlight wrong-doings of the culprits mainly the anti-people police and administration. The proposed Kanhar Dam is controversial and subjudiced in High Court. Without conducting any fresh cost benefit analysis and social and environmental impact assessments, and violating the order of the National Green Tribunal dated 24th December 2014 whic mandated Environment Clearance and Forest Clearance for any construction by Irrigation department of UP, the government is illegally going ahead with the construction. We appeal to concerned citizens to demand immediate stop to this use of coercive force against poor people and women in Kanhar Valley. Take action and ask the following authorities to punish the erring police and administration. Demand justice to the struggling people, including immediate medical treatment of the injured and reparation efforts towards the families of those who have been murdered by police machinery. Stop illegal construction of Kanhar dam and forcible land acquisition. Ensure land and forest rights of the people of Kanhar Valley! Land Acquisition Bill is in the interest of ?